“We can qualify for the Champions League” Ah, how they laughed. Where have all the boo-boys gone? When you go a while without seeing an Evertonian whinge about the style of play, Kenwright, results, Kenwright, the redsh*te, Kenwrong and how unfair life is in general, you know we’re on a boss run. There isn’t really any good reason to moan, as we’re in the sort of form that makes you dream of things you shouldn’t. That sort of feeling when the lottery’s on and you’ve got two numbers out of two. Fair way to go yet, lads. We’re not even half way. At the start of the season, most of us would’ve looked at the shite (H), Stoke (H), Man Utd (A) and Arsenal (A) and thought that 6 points would be a hell of a result. In reality, we’ve passed through the first tough run of games (plus Stoke) unbeaten, with 8 points in the bag and praise ringing in our ears. Would you credit it. It’s just one of those enjoyable spells when you thank God and any other praise/blame-taker that you were born a Blue. Then there are times that you simply thank them for not being born a kopite. It’s one of the certainties of life that all good things will (and must) come to an end, but that doesn’t mean we can have a right party while the magic lasts, eh? Get the pyro out. In one of the most enjoyable debates I’ve ever participated in, the talk over whether the win at Old Trafford or the draw at the Emirates was better. Yes, it was great to stick it to David Moyes with a late winner and stroke the ball around the Old Trafford turf as if we owned the place, but the Arsenal game was special. To start with, we put Arsenal in the position so many visiting sides – us included – have had to toil in, chasing shadows for half an hour. And then, when they scored with about fifteen minutes left, we hit back. No-one does that to this rolling juggernaut that is 2013 edition Arsenal. Normally Arsene Wenger can brush off a draw with cries of “they were very physical”, and I think he mentioned it again in what must be just the token insult for the thousands who have made Jack Wilshere fall over and clutch his shin as if he’s lost it, but he had to praise us. As has everyone, really. Alan f*cking Hansen did. The public (as in non-Evertonians) can finally see how boss Ross really is. And Mark Lawrenson has had to eat a fair old serving of humble pie for predicting two successive away defeats for Roberto’s Blue Army. I’m going to avoid calling it a brand new era of Everton greatness and Eighties-esque success, but it’s one hell of a good run of form. Right now, we’d actually want to be playing Chelsea, Citeh and the sh*te again. 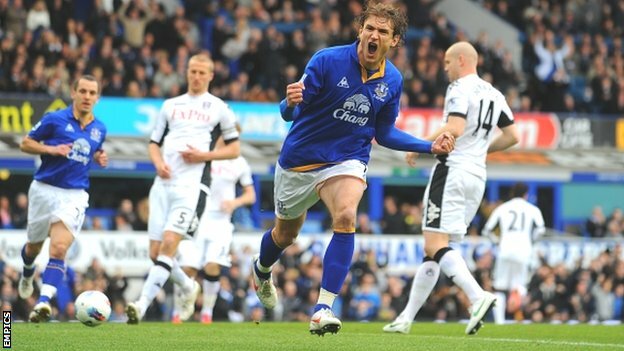 But we’re playing a side we regularly crush at Goodison, Fulham. Which worries me. We’ve got an annoying knack of playing to the standards of our opponents, and although that’s grand against Arsenal, we don’t want Phil Jagielka to turn into Philippe Senderos….ever. I mean, look at it. We’ve lost three of our last 26, and they’ve lost 6 of their last 7. And wouldn’t you know it? That win was last week, ending a run of six defeats on the bounce. So they’re on the up. ‘Course they are. And they beat our B-team in the League Cup. Actually, no…it doesn’t bother me. Their record at Goodison Park in league games is awful. 4 draws and 21 defeats, with an aggregate scoreline of 51-10 to the mighty Blues. Our previous home win was 4-0 against a much more resilient Stoke side, and the best win before that? Fulham, 2012. Some boss Croat slotter put them to the sword. A look at their side doesn’t give them much hope either. The XI they put out against Aston Villa was the oldest average line-up of any team this season, which suggests a fair lack of pace and agility. And there is. Senderos, Berbatov, Riise, Hughes and Parker is a veritable Premier League old folks’ home. Stekelenberg looks relatively average after a knock that stalled his debut season in England, while Sascha Riether at right-back always looks like he’s going to do something daft. The wings is where this game will be won, especially with Sidwell and Parker locking horns with Barry and his makeshift midfield counterpart – we’ll get to him – in the centre. Tim Howard is apparently boss without the beard, so we’re fine there. Bryan Oviedo, that smooth floppy-haired sort with 2 goals in 3, will have to deal with the industrious (which is like regular sh*te, but very hardworking) Ashkan Dejagah, and he and Steven Pienaar on the left will be able to use the fact Riether’s constantly out of position to punish Fulham. Seamus Coleman only has Nicklas Alexandarsson-wannabe Kacaniklic to deal with, and the best-before-2003 John Arne Riise. Jagielka and Distin only have to breathe on Berbatov or Darren Bent – once England’s number 9, would you believe – to get them arsey and not arsed about the ball. James McCarthy proves how ace he has been by being notable by his absence this weekend. Roberto Martinez reckons he has plenty of options, but do we really want to see Johnny Heitinga in the middle come 3 o’ clock Saturday? Nah. His options basically are shifting Barkley or even Mirallas – as he suggested – to the middle and bringing in Deulofeu. That’s the sort of thing he’d do, they beaut. Or Leon Osman could graft in the midfield and let Barkley have a crack at a creaky Fulham defence, who will be pounded into submission by himself and Lukaku. It’s nice to have such a dearth of options. Steven Naismith’s there too – hopefully not offering Fulham charity as he has done to many homeless people with The Whitechapel Centre. Well in Naisy. Fulham have a new boss and a solitary home win to brag about. Grand. We’re on the up and the up, us. Somehow I’ve rambled on for this long when just a few words would suffice. Sin miedo. Or, to provide wise words from our own fair city, let’s have ’em. These are sh*t, these.